Homebot.ai helps real estate agents and loan officers build better relationships and repeat-and-referral business with their clients by maximizing their wealth. This engagement platform provides your clients with the best tips, tricks, and advice on how to track and build their equity while saving money. And it’s completely personalized with your branding - so you can stay consistent in your messaging while helping your clients save money and build their wealth over time. Clients even get personalized information like calculations, market data, refinancing scenarios, and much more to empower them to make educated decisions. Now with BombBomb videos, Homebot.ai loan officers and agents are able to personalize their content even more by sending their clients face-to-face videos! Now Homebot users can completely personalize their communication with clients, sending them a video to put a face to the name. Additionally, you can track engagement on your emails sent from BombBomb to follow up accordingly and even do a screen-recording with the monthly digest to explain individualized stats. To set up your Homebot.ai integration, watch the video above! 1. First, understand that in order to use BombBomb with Homebot, you'll first need to create a BombBomb account (if you don't already have one). You can sign up with BombBomb (or test it out with a free trial) by going to: https://bombbomb.com/tryitfree/. If you don't sign up for BombBomb beforehand, don't worry! 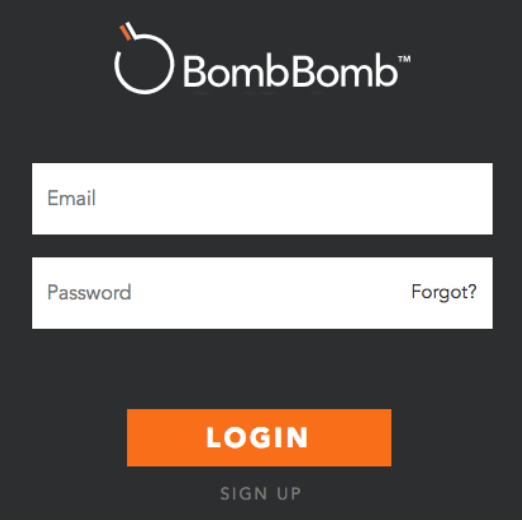 You can still sign up for BombBomb later from your Homebot account (read on to learn more). 2. Log in to your Homebot account at www.homebot.ai to integrate your two accounts. 4. Now, click the far right 'INTEGRATIONS' tab (featured below by the pink arrow) to view your available integrations. 5. Want to connect? It doesn’t matter if you already have a BombBomb account -- the integration is easier than pairing the bluetooth in your car. Just click the pink ‘Connect to BombBomb’ button (featured below by the pink arrow). 6. Now, BombBomb will prompt you to to either 'LOGIN' to your existing BombBomb account or to 'SIGN UP' with a BombBomb account to continue the integration (see below). 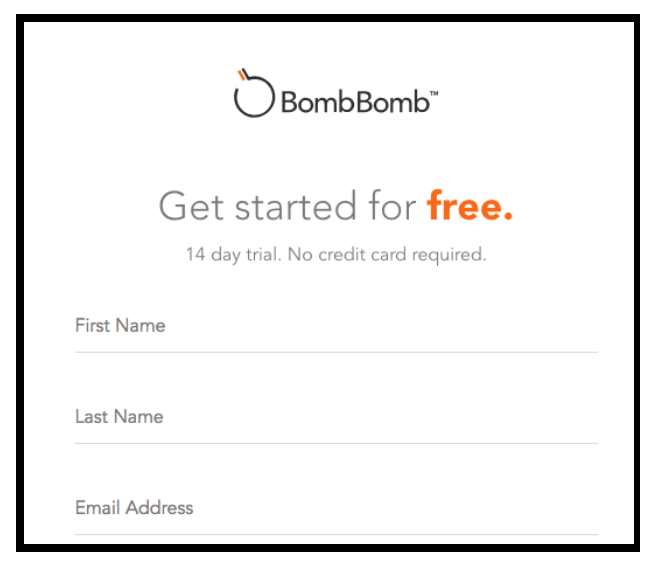 If you don't have a BombBomb account, but you want to test it out, don't worry, you can 'Get started for free' with a free 14 day trial. No credit card required (see below)! 7. Once you’ve signed into BombBomb or signed up with BombBomb, you will be taken to a new screen where Homebot will ask to authorize access to BombBomb (this is necessary to allow you to record your screen in Homebot). Just click the orange 'Allow' button (featured below by the pink arrow). 8. After you have authorized Homebot to view your BombBomb account, you’ll be returned to the ‘INTEGRATIONS’ tab where you will see a sweet success message, 'Connected' (featured below by the pink arrow). 9. Congratulations! You have successfully integrated Homebot and BombBomb. Read on to learn how you can create custom videos for your clients using this new integration. 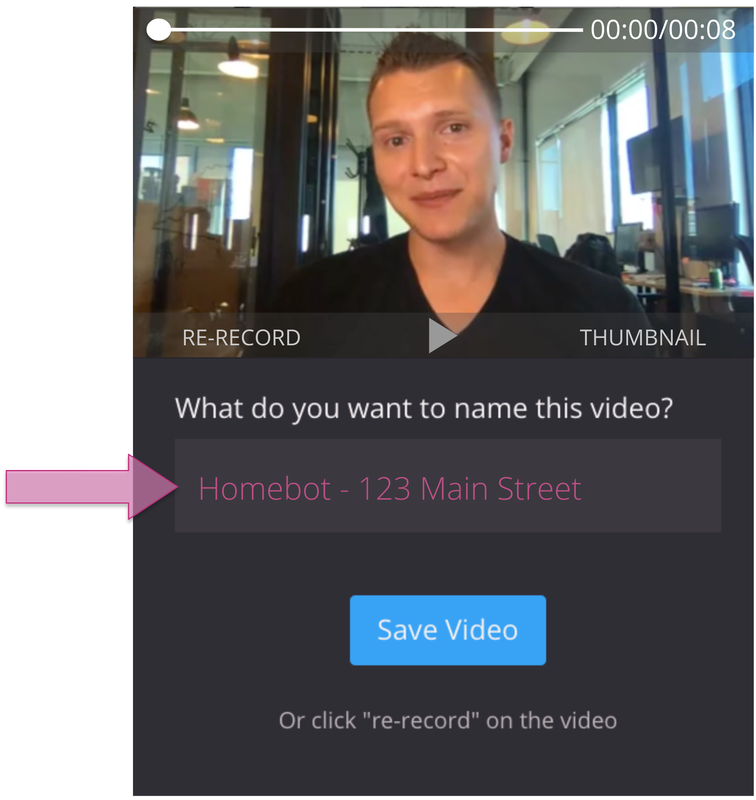 Now that you've integrated your Homebot account and your BombBomb account, you can start utilizing them together to create customized videos for your clients. Check out the video tutorial above or read the detailed instructions beneath to learn how. 2. In the upper right hand corner of your client's digest, you can see the red 'RECORD' button (featured below by the pink arrow). Click the red 'RECORD' button to begin filming your BombBomb video for this particular client and their particular home (the home address is listed next to the notifications bell in the top menu). If you’re on your mobile device, it works just like the BombBomb you know and love. 1.Start recording your video by clicking the red 'RECORD' button in the center of your video screen. You'll get a 3 second countdown warning before your video recording begins. Smile for the camera! 2. When you are finished recording your video, click the red 'STOP' button (a red circle around a red square icon) to stop your recording (the stop button will appear in the same spot that your record button previously was). 3. To preview your video, click the triangular 'PLAY' button in the video screen located at the bottom and in the center of your video screen (the white triangle). 4. If you wish, you can even create a custom photo for your video by clicking the white 'THUMBNAIL' text (in the bottom right of your video screen). 5. You can also click the white 'RE-RECORD' text (in the button left of your video screen) to create new version of your video (this function automatically deletes the old video). 6. 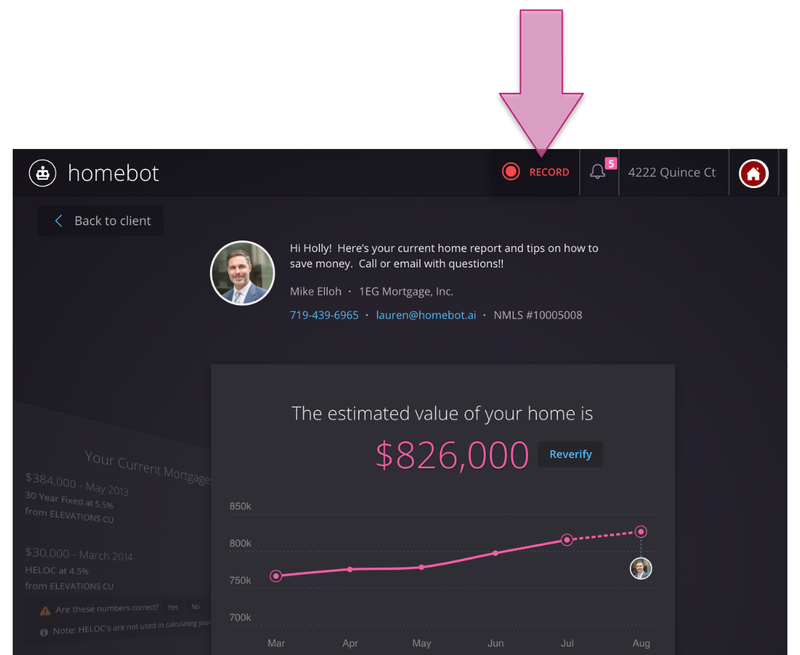 Homebot will automatically suggest a video name based on the property address of the selected client (featured in the photo below next to the pink arrow) and will insert a link “View your Homebot Report ››” that sends the client directly to their home digest. 7. Feel free to name your video whatever you'd like by clicking in the box, deleting the text, and retyping the new video name. 8. Once you are happy with your video, click the blue 'SAVE VIDEO' button to save your personalized video. 9. This will take you to the 'Send Your Video' box. Here, you can edit the recipient's email address (Homebot will automatically suggest the client's email address associated with the digest). 10. Don't forget to edit the message 'Subject,' and 'Message Content' to personalize your video message. 11. 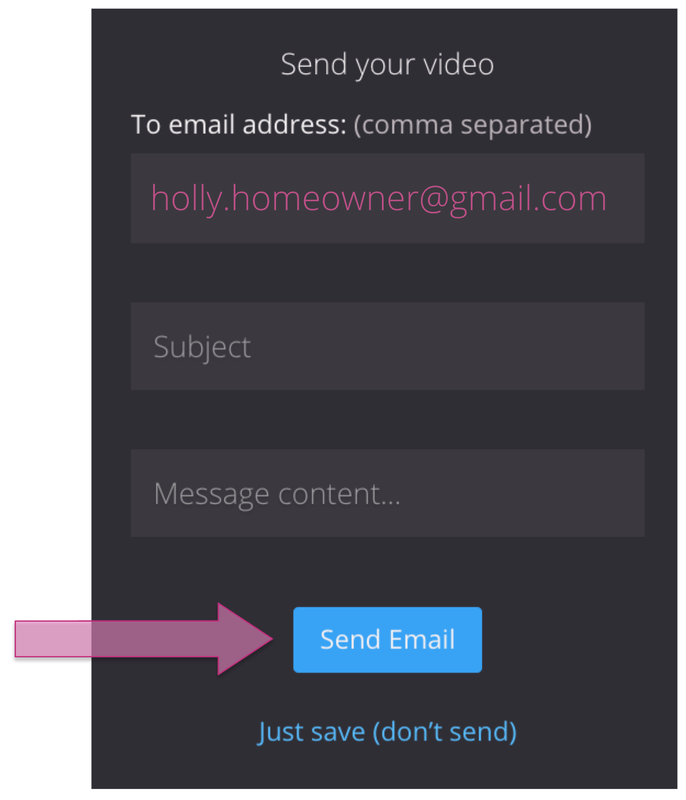 When you are ready, click the blue 'Send Email' button (featured below by the pink arrow) to send your BombBomb video and Homebot Digest email to your client. 12. If you choose not to send the video, just go ahead and click 'Just save (don't send)' directly below the blue button. If you’re on a computer with a webcam you can record and send just like your phone OR you can use BombBomb’s new screen recorder to speak to the digest while you’re showing it on the screen (Hint: Watch the 2nd video for an overview on how to do this).